Every single drawing class I’ve ever taken requires you to draw some sort of landscape or architectural drawing to emphasize the importance and deceptiveness of perspective. I’ve always preferred drawing figures or still life work, but drawing is like weight lifting. If you only focus on one kind of muscle group you limit your ability to handle more complicated movements. With that in mind, this edition of MLASTMP focuses on some of my favorite architecture in Philadelphia. When I used to work in the city I would walk by this building on my way home and I would always stop and look up at it. I love it’s lines and colors. Philadelphia is one of those cities that never lost it’s historical personality – in fact you can see it’s colonial style entrenched deep into the city’s landscape. 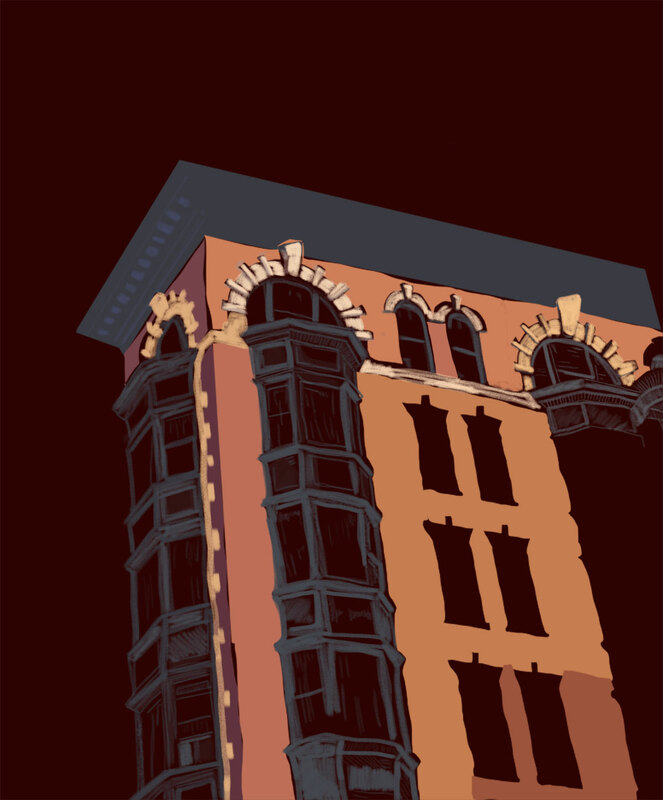 Much like last time I wanted to focus on creating a digital drawing of this building using textured brushes and flat color, the dark background emphasizes the depth inside the building and brings out the textured lines of the windows and shades. The drawing itself is not yet complete and I’ve considered printing it out to work more into a physical copy using wet materials. When I do I’ll post the finished result to the blog. What’s your favorite part of drawing? What do you least like drawing?